Scientists have for the first time generated stem cells from one of the most rapidly progressing forms of Parkinson's disease. Researchers, led by a team at the University of Edinburgh, used skin samples from a patient with the condition to create brain nerve cells. The development could help scientists determine why certain nerve cells die. It will also make it easier to test new drugs which could slow or halt progress of the disease. 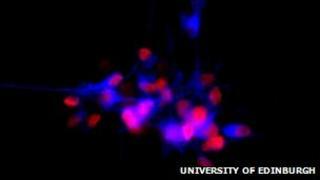 The researchers, working in collaboration with University College London (UCL) and funded by a £300,000 grant from the charity Parkinson's UK, were able to generate brain nerve cells affected by the disease using the skin cell samples. The aim is to eventually find drugs that can prevent the death of these key cells, known as neurons, which break down as a result of Parkinson's disease. Dr Tilo Kunath, of the university's medical research council centre for regenerative medicine, said: "Current drugs for Parkinson's alleviate symptoms of the condition. "Modelling the disease in a dish with real Parkinson's neurons enables us to test drugs that may halt or reverse the condition. "This study provides an ideal platform to gain fresh insight into the condition, and opens a new area of research to discover disease-modifying drugs." The neuron cells were generated from a patient with a form of Parkinson's that progresses rapidly and can be diagnosed in people in their early 30s. People with this form of Parkinson's have twice as many of the genes that produce a protein - alpha synuclein - compared with the general population. Although this form of Parkinson's is rare, the protein involved is linked to virtually all types of the disease. Dr Michael Devine, of UCL's institute of neurology, said: "Understanding such a progressive form of the disease will give us insight into different types of Parkinson's. "As this type of Parkinson's progresses rapidly it will also make it easier to pick up the effects of drugs tested to prevent nerve cells targeted by the disease from dying." Dr Kieran Breen, from Parkinson's UK, said: "Although the genetic mutation that leads to this progressive form of Parkinson's is rare, this exciting study has the potential to bring about a huge breakthrough in Parkinson's research. "This is just the kind of innovative research that Parkinson's UK is committed to funding as we move closer to a cure."